Shhhh … be very quiet. John Krasinski’s horror thriller A Quiet Place (2018) revolves around a family surviving in a world stalked by danger. Any loud noise, day or night, draws a lethal attack from powerful alien monsters that quickly devour their prey. 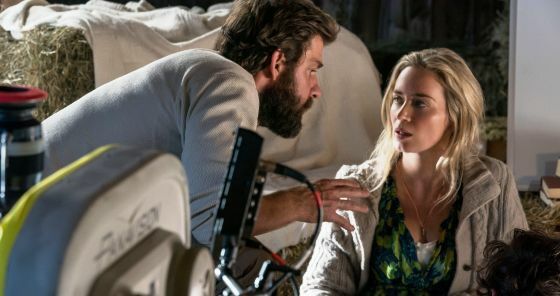 The family comprises father Lee Abbott (John Krasinski), mother Evelyn Abbott (Emily Blunt), their deaf oldest child and daughter Regan (Millicent Simmonds – who is deaf in real life), and sons Marcus (Noah Jupe) and Beau (Cade Woodward). Having moved out of the city they have made a life for themselves secluded in the woods on a small farm where they carefully live an inventively quiet—almost silent—life. For them it’s a little bit of utopia in a dystopic world plagued by a hungry pitiless alien. Family tension is introduced early with the death of the youngest son Beau. After not listening to his father he steals a small battery-powered toy from a store in which the family is silently foraging for food. Using sign language Lee tells Beau that the toy is “too loud,” carefully taking out the batteries. As the family silently leaves the abandoned store Regan hands the toy to her little brother and, against his father’s wishes, he takes the batteries and follows his family. When the toy inevitably makes a noise Beau is snatched right before their eyes leaving a gaping hurting hole in their family which, along with grief and guilt, quietly touches practically every scene and interaction in the film. Lee and Evelyn conceive again and the pregnancy brings tension and drama into the plot first because it is a reminder of their lost son secondly because they know babies are noisy and noise is a problem. Could anyone keep quiet forever? What noise would attract death? These questions dog viewers with every soft step the Abbott family makes as the film unfolds like a felt flannelgraph. The film’s premise means the smallest sound in the theatre alarms viewers creating an ambiance where even the sound of eating popcorn or crinkling a candy wrapper feels perilous. Blunt and Krasinski are married in real life and this relationship brings a lot of great chemistry to the screen. With children of their own they are believable as parents and a married couple. Viewers may know Blunt from films like Sicario (2015) and Edge of Tomorrow (2014) and the musical Into the Woods (2014). In 2018 she’s starring as Mary Poppins in Disney’s new movie Mary Poppins Returns (2018). Krasinski is best known for his role as Jim in the TV sitcom The Office (2005-2013). Along with directing and acting in A Quiet Place Krasinski is listed as a writer which has created some buzz because he’s known for comedy not horror. With A Quiet Place receiving strong reviews, Hollywood is left wondering if this is a fluke, a coincidence, or a trend following the equally unexpected success of comedian Jordan Peele’s film Get Out (2017). Like Krasinski, Peele is an actor, writer, and director best known for his sketch comedy work on Mad TV (2003-2008). 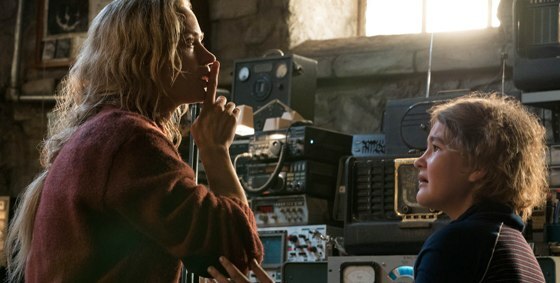 But be warned A Quiet Place is no comedy; rather it is a heartfelt family drama against the backdrop of horror. Although the film focuses more on suspense than gore, the alien monsters do eat a couple people! Christian viewers will be pleased to see a strong portrayal of a family. Father and mother love each other, the father is the head of the family, and the mother, while respectful of her husband, is strong and courageous. This is a family that despite their challenges joyfully prays at dinner and cares for each other. The praying scene is brief but welcome and in no way mocks prayer. It’s presented in a natural and matter-of-fact way not often displayed in film. The film embodies and invokes what St. Peter writes in 1 Peter, “Likewise, husbands, live with your wives in an understanding way, showing honor to the woman as the weaker vessel, since they are heirs with you of the grace of life, so that your prayers may not be hindered,” (1 Peter 3:7) and what St. Paul says in Colossians, “Husbands, love your wives, and do not be harsh with them. Children, obey your parents in everything, for this pleases the Lord. Fathers, do not provoke your children, lest they become discouraged” (Colossians 3:19–21). Likewise Paul writes in Ephesians, “Children, obey your parents in the Lord, for this is right. “Honor your father and mother” (this is the first commandment with a promise), “that it may go well with you and that you may live long in the land”” (Ephesians 6:1–3). In A Quiet Place not listening to parents brings immediate life-threatening danger. Reformer Rev. Dr. Martin Luther quotes these passages in his Small Catechism under the heading “Table of Duties” where he provides Scripture quotations as admonishment and encouragement to people living their vocations and fulfilling their responsibilities to each other. Viewers will be quick to note that Evelyn Abbott is not weak in the modern sense of term. She is strong and resourceful, yet deferential to her husband in a way that may irk some viewers. Over and over again the film shows that their survival is built on clear lines of traditional authority. Some will find this hard to take, and harder to take when understanding that with those lines of authority parents and children receive great opportunity to flourish and act in brave, bold, and daring ways to serve, save, and protect each other in times of peril. In no way does this traditional family feel repressive, abusive, or unloving; just the opposite. There is forgiveness, love, and moments of happiness alongside their grief, loss, and trouble. The Abbotts are an exceptional and believable film family. 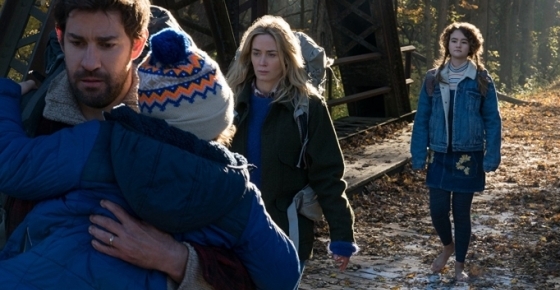 With that said it should be no surprise that at its heart A Quiet Place has a positive pro-life narrative. First it’s notable that the family is larger than average for modern North American culture. The Abbotts already had three children before the alien attacks started to impact the world. Secondly, and more importantly, while the pregnancy provides dramatic tension with the knowledge that a baby will bring noise, at no point is it suggested the family would consider terminating the pregnancy or killing the baby after its birth. The baby on the way is their child and they love that child as much as any of their other children and as a family they are prepared to fiercely protect their child. Additionally, including the pivotal character Regan, their deaf daughter, shows a family that doesn’t shrink away from her disability but loves and cares for her. In fact, the father’s love and care for her actually contributes to the family’s survival. Likewise key to their survival is using sign language to communicate with each other thereby giving the whole family a distinct advantage as the world around them falls silent. Regan’s deafness, and their care for her unique needs, is depicted as a valuable strength not a hinderance. This is a rare horror film where characters are developed so that viewers become invested in them and their survival as opposed to horror films that include characters for the sole purpose of gruesome deaths. A Quiet Place is not that kind of film. For those who enjoy suspense and thrills, Krasinski has made a thoughtful and emotionally rich film. 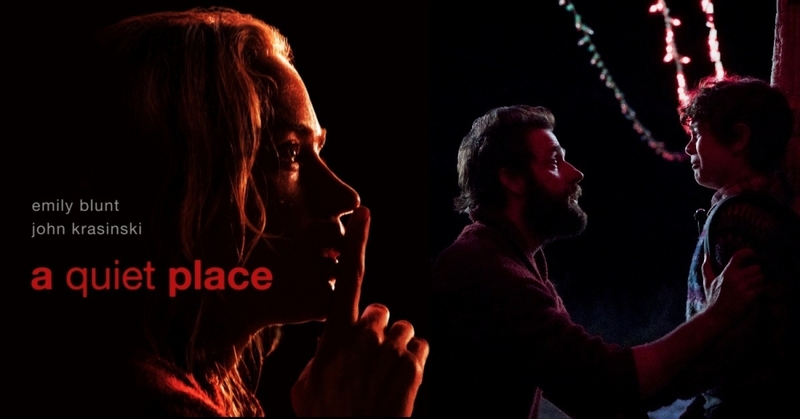 The acting is good, including the children who are excellent which, along with very good special effects, makes A Quiet Place well above average in the genre.